The ASUS RT-N56U is usually pictured standing up, but it can actually be placed in two orientations depending on the specific needs of the user. 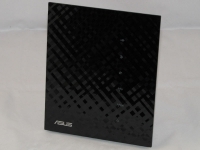 Without using the stand it can be laid down like a traditional router, as shown in the image below. Using the stand, it can be installed upright, which gives it a more unique look, but also prevents all attached cables from laying flat. On the front of the router there are 6 tiny blue LEDs, which provide a way to quickly see the status of the router. These LEDs will indicate that a USB device is connected, LAN connection, WAN connection, the band that is active (both will flash during activity), and finally a power LED. 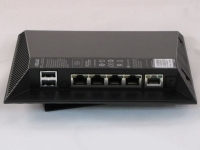 Taking a closer look at the ports provided on the RT-N56U; from left to right there are two USB 2.0 ports, a reset button, four Gigabit Ethernet wired connections, the up-link Ethernet connection, the power supply connection, and finally the WPS button. The USB ports can be used for wireless printing , scanning, and file sharing. Large downloads can be left unattended (or with the PC turned off) with direct HTTP, FTP, or BitTorrent downloads from the Internet to the USB attached storage. 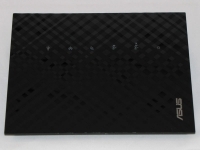 In addition, with attached storage the RT-N56U is capable of acting as a UPnP AV server and SMBA server.